Irwin Sacred Heart Catholic H.S. Irwin (population 92) is located in northeastern Illinois in the southwest-central portion of Kankakee County. 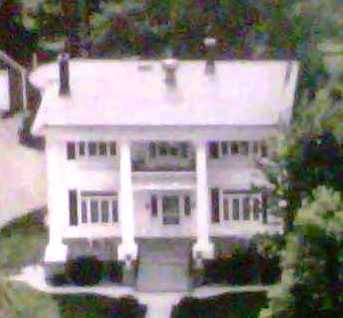 This places Irwin about 10 miles southwest of Kankakee. County Road S 6000W is the main roadway to Irwin, connecting it to Illinois Route 115 just one-half mile to the north. The Illinois Central Railroad passes through the center of Irwin. The history of the town of Irwin is in need of research. According to information found in Jim Ridings' books titled "County West, A Sesquicentennial History of Kankakee County West," and "County West Companion, A Further History of Western Kankakee County," Irwin once hosted a very progressive catholic high school for girls named Sacred Heart. The articles were submitted to us by Sherree Benoit. Mr. Ridings' books tell us that Sacred Heart School was established in 1917 and was the only Catholic high school located in Kankakee County West. 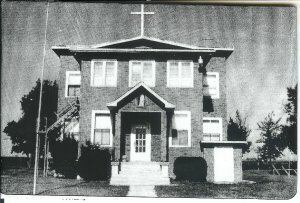 The school was affiliated with the St. James Catholic Church. 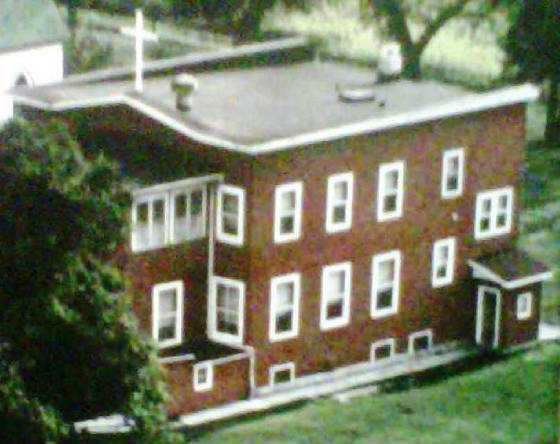 When first built, Sacred Heart was meant to house boarders. Boarders in the early years came from as far away as Chicago. Sacred Heart offered grade school classes for grades 1-8 and three years of high school. Students wishing to attend a fourth year would attend Kankakee St. Patrick High School or Herscher High School. We have found out that Sacred Heart ceased to offering high school courses in 1930. One photo does state that the school's name was changed to St. James The Apostle School "in later years." 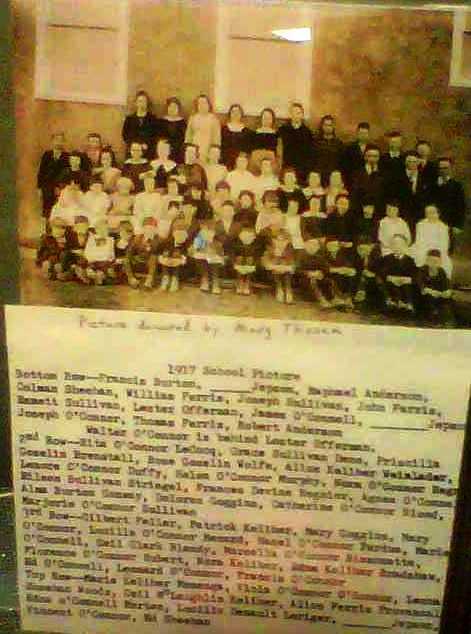 Another photo states that the first communion for St. James The Apostle School was in 1950. 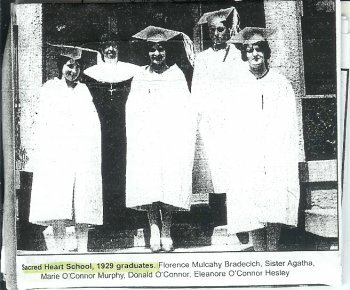 The article also shows a photo of the Sacred Heart High School graduating class of 1929 (see below). 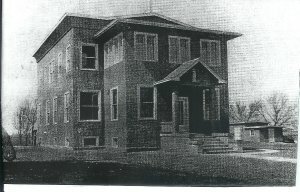 The school was an all-girls' institution of an average enrollment of 15-18 students, taught by the Sisters Servants of the Holy Heart of Mary. The school was also an approved secondary school of the Illinois Department of Public Instruction, and closed due to the lack of teachers from the order. 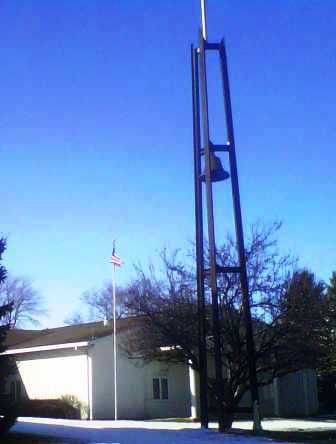 The building that served as Sacred Heart High School continued to serve as St. James The Apostle Grade School until this school, too, was closed in 1965. 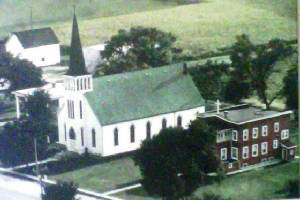 The building was used for church classes until it was demolished in 1978 to make room for a newer parish hall. If you have any information on sports or extra-curricular activities offered at Sacred Heart High School please contact us via the means listed below. We are missing a lot of the history information, items that deserve to be recognized at this once proud school in the small hamlet of Irwin. Would You Like To Help Us in Remembering Irwin Sacred Heart Catholic High School?